Founded in 1883, MPhA’s sole mission is to serve Minnesota pharmacists in an effort to advance patient care. MPhA is one of the longest formed pharmacy associations, not only in the state of Minnesota, but in the country. As such, MPhA has many valuable resources and best practices to offer members. Minnesota is recognized as a leading state in patient care and pharmacy practice. We focus on helping, sustaining, and enhancing the careers of Minnesota pharmacy professionals. MPhA’s membership and support is 2,200 and growing! Our members enjoy easy access to high-quality Minnesota pharmacy programs with experts in the field, through our Annual Learning Networking Event, Medication Therapy Management Symposium, monthly Virtual Coffee Break webinars, our Legislative Day, the Leadership Summit and House of Delegates, and other CE sponsored programs. We offer the support and resources our members need to help advance their practices, businesses and professional development, and patient care. 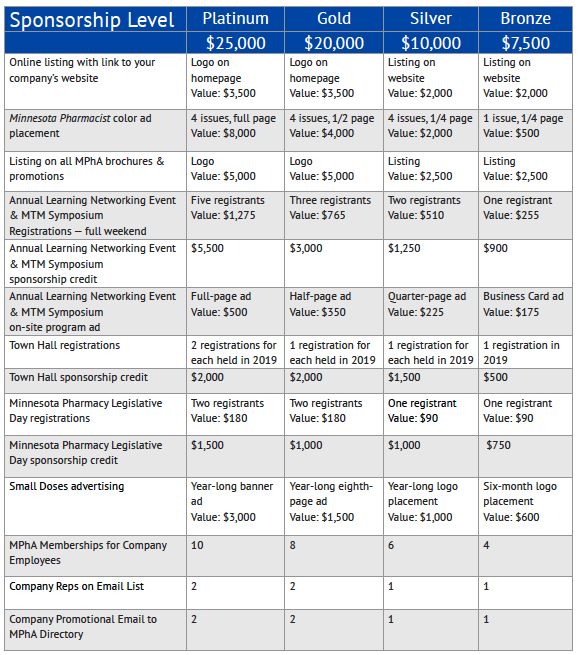 As an Annual Partner with MPhA, you will have access to numerous exposure opportunities throughout the year. An opportunity to network with thought leaders and decision makers. An opportunity to expand possibilities by becoming part of a larger network. When your customers thrive, you thrive and MPhA is committed to leading the rapidly changing pharmacy landscape in Minnesota. Keep you and your company in front of your customer base all year long. Reach your customers through a wide variety of mediums. Register today to become an Annual Partner with MPhA! Questions? Please contact Blake Finger at the MPhA Offices at BlakeF@mpha.org or at 651-288-3423.